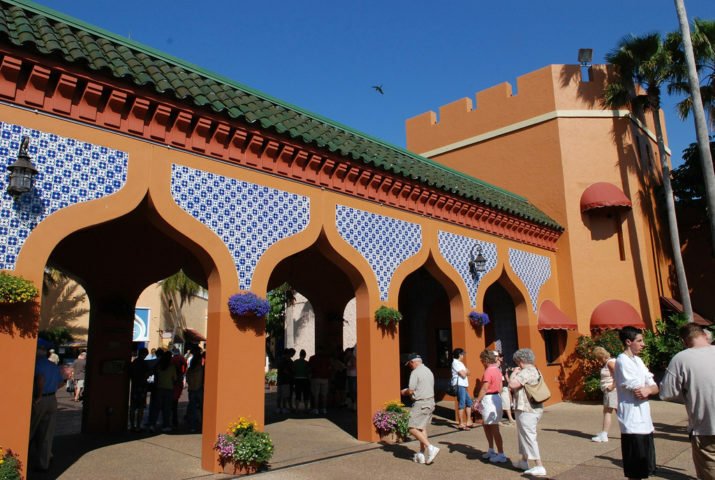 Busch Gardens Tampa is one of the nation’s most popular theme parks. It’s also home to thousands of exotic animals — many of which are on the verge of extinction in their natural habitats. 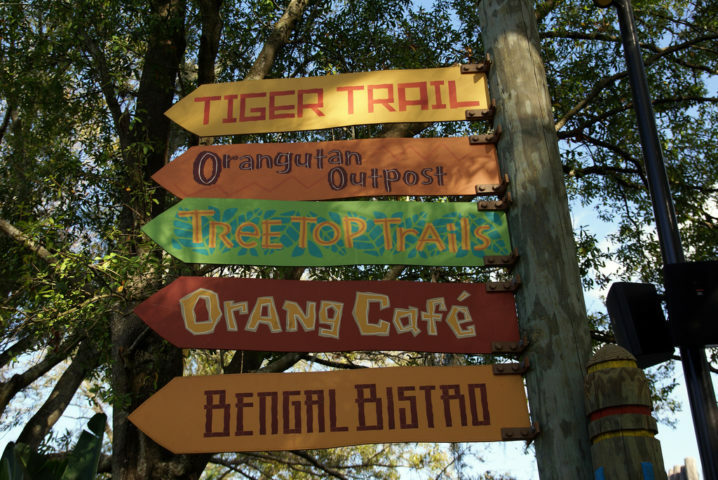 Wondering what you absolutely must see & do when you’re visiting Busch Gardens? I’ve been visiting Busch Gardens Tampa on a regular basis since 1981, and I’ve got many tried & true tips for making the most out of a day there. #1 – Arrive as early as possible. This tip could apply to visiting any theme park, but it is especially useful for spending a day at Busch Gardens Tampa. The park is large and has many things to do. Frankly, I’d say the best way to enjoy Busch Gardens is to spend at least 2 days there — one day for the rides and shows, another for the animals and enjoying the lush gardens. But, if you’re like most people who visit the park, your stay is for just 1 day. So to make the most of that 1 day, you’ll need to arrive as early as possible. Generally, the park operating hours range from an opening time of 9 AM during peak operating hours and a closing time between 8 and 10 PM on most busy evenings. During off-peak season, the park may open as late as 10 AM and close as early as 5 PM. Choose 1 or 2 rides that you’ve heard about and would like to experience. Check out the current show at the Moroccan Palace Theater — this is usually where the park’s headlining, non-concert productions are staged. Stop by the Bird Gardens to check out some of the park’s lushest tropical-flavored displays. Get lunch at the Serengeti Overlook Restaurant, or catch dinner and a show at Dragon Fire Grill. Take a ride on the SkyRide or Trans-Veldt Railroad to see the animals on the Serengeti Plain, or walk through the Edge of Africa for an up-close and personal visit with some of Africa’s most beloved animals. #2 – Protect yourself from the elements. It can get very hot and humid during the summer months in Florida. While the official temperature in Tampa has never reached 100 degrees, summertime temperatures easily soar into the 90s, and humidity can make being outdoors rather uncomfortable for some. Despite the heat and humidity, you can still have a wonderful time at Busch Gardens in the summer! Bring along a hat to keep the sun off your face and neck. Buy plenty of water at the park to help you stay hydrated. Plan to do indoor things — such as watching shows and eating — during the late morning and early afternoon, when the sun is most intense. Wear sunscreen to protect your skin from the intense summer sun. While it can get hot in the summer, Florida is quite pleasant in the winter. If you visit in the winter, then you might want to take along a light jacket. After all, Florida isn’t always hot — there are at least 1 or 2 days each winter in the Tampa area when the temperatures don’t rise above the 40s. #3 – Get a lay of the land inside the park with a ride on the SkyRide. Want to take in more of the park as quickly as possible? Hop on the SkyRide! This popular gondola ride (a Von Roll 101 model, for all of you cable car and sky ride enthusiasts out there) takes guests between the Cheetah Hunt roller coaster near the front of the park to the Congo section in the back. In between, you’ll catch the sight of hundreds of animals freely roaming on the Serengeti Plain habitat, get to see some of the park’s most popular roller coasters up-close, and get a better feel for the layout of the park. The SkyRide, which is closed during inclement weather, generally takes only 10 minutes to ride one-way. #4 – Ride the coasters when the lines are shorter. People often ask me how best to get in all of their favorite rides in during a visit to Busch Gardens Tampa. My best tip is to stop by the most popular attractions first. It used to be that most of the rides were located in the back of the park, but in more recent years roller coasters such as Montu, Cheetah Hunt, and Cobra’s Curse have been built not far from the main entrance. Therefore, it makes sense to arrive at the park early and take advantage of the park’s walking-loop pedestrian layout to enjoy all of the big rides as they come — aiming in a counter-clockwise direction (from right side of the park to the back, and then to the left). Cheetah Hunt — This multi-launch roller coaster takes guests at speeds of up to 60 MPH. Cobra’s Curse — A spinning family-style roller coaster that brings riders up close and personal to a cobra king. Montu — An inverted roller coaster that takes riders at speeds up to 65 miles per hour through 7 inversions. Scorpion — A classic steel roller coaster with several 360-degree loops. Sand Serpent — This wild mouse roller coaster playfully whips its riders through multiple twists and hairpin turns. Kumba — A large steel roller coaster with seven inversions and several first-of-a-kind elements. SheiKra — This 200-foot-tall dive machine roller coaster plunges riders 90 degrees straight down a 20-story drop before hurtling them into a breathtaking 145-foot-tall Immelmann loop. Air Grover — A fun kids roller coaster themed around Sesame Street’s Grover monster character. Stanley Falls Log Flume — One of the largest traditional log flume water rides in the Southeast. Congo River Rapids — A white-water rafting ride that takes guests through perilous passes in a lush jungle. Falcon’s Fury — A 335-foot-tall drop tower that plunges riders straight to the ground face-first. Phoenix — A looping starship ride that takes guests upside down high above the desert city of Pantopia. #5 – Consider buying a Quick Queue fast pass — it’s definitely worth it! If you’re going to Busch Gardens on a crowded day, it’s almost always worth the price to buy a front-of-the-line fast pass — which at Busch Gardens is called a Quick Queue. The Quick Queue pass allows you to jump to the front of the line at several of the park’s biggest thrill rides. Quick Queue prices vary throughout the season. #6 – Don’t forget to see the animals. 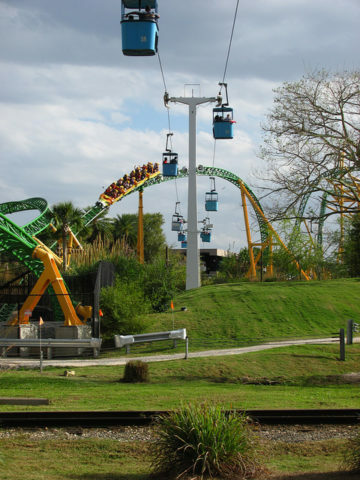 Many people naturally associate roller coasters and other thrill rides with Busch Gardens. 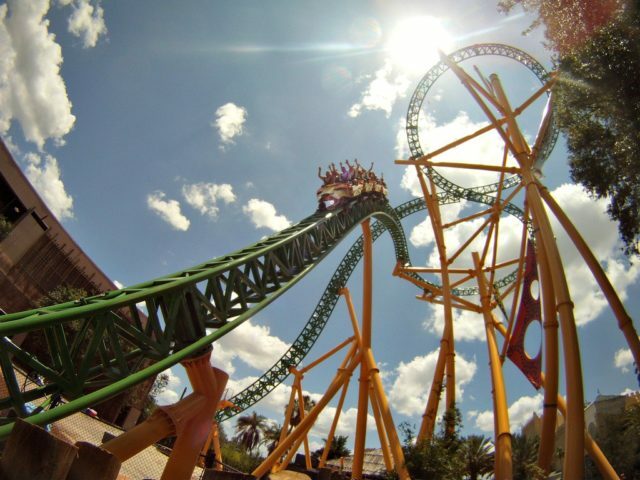 True, Busch Gardens offers one of the most exciting collections of thrill rides anywhere. But one of the many elements that make Busch Gardens Tampa unique is that it also serves as a sanctuary for some of the world’s most beautiful and endangered creatures. Animals of all colors, sizes, and types are found throughout park in habitats along the major thoroughfares, but there are several notable animal attractions that will take you off the beaten path. Myombe Reserve — This fog-shrouded forest serves as a sanctuary for chimpanzees and lowland gorillas. Cheetah Run — A preserve that house several cheetahs, which are otherwise known as the world’s fastest land mammal. Edge of Africa — Populated by a wide array of species, Edge of Africa is inhabited by lions, meerkats, and hyenas (oh my!). Curiosity Caverns — This man-made cavern is filled with bats, snakes, and other creatures of the night. Jambo Junction — Baby animals melt the hearts of the many who pass through this beloved facility. Tiger Trail — Majestic orange and white bengal tigers roam the paths in this multi-level naturalistic habitat. Lory Landing — This tropical-themed aviary is the home for hundreds of colorful exotic birds. Walkabout Way — Hand-feed kangaroos and wallabies, and say hello to magpie geese in this popular habitat themed like the land down under. Busch Gardens Animal Care Center — This fully functional animal hospital is where many of the park’s animal residents receive care. Stop by on a weekday morning for your best chance of catching a real, live animal operation. Speaking of animals, you can even get the chance to hear some of the park’s animal keepers talk about the creatures they care for. Keeper talks and presentations are held at various times and locations throughout the park. #7 – Take in a show. Busch Gardens Tampa has long been famous for its world-class shows. From energetic Broadway-style ice-skating shows and enchanting belly dancing performances to comical animal acts and toe-tapping music revue programs, there are many entertaining productions on stage every day at Busch Gardens. There are also many live concerts at Busch Gardens throughout the year — most of which are free with park admission. Real Music Series — A wintertime concert series consisting of well-known artists from yesteryear. Food & Wine Festival — This annual foodie feast serves up a wide array of delicious delights and hosts many headlining rock and pop performers. Viva La Musica — Latin-flavored artists drum up spicy musical fun at Busch Gardens during the spring. Glory at the Gardens — This springtime Christian rock band series draws large crowds with inspiring music. There are plenty of exciting entertainment options at Busch Gardens every day, so be sure to check out the latest show schedule at the park or online! Summer Nights — Summer Nights is an event that runs from June through August and provides extended evening hours, special performances, fabulous fireworks, and other sizzling surprises. Howl-O-Scream — One of the most popular Halloween theme park events in the United States is Howl-O-Scream. This annual spook fest, which runs from late September through October, offers scary shows, haunting houses and maddening mazes, and several other frights not for the faint of heart. Christmas Town — Ring in holiday cheer at Christmas Town, an annual holiday extravaganza that takes place on select evenings in late November through December. See more than 1 million lights, meet Santa Claus, and enjoy special Christmas-themed shows. Oh, and don’t forget to raise a toast with some tasty hot chocolate! #8 – Buy an All-Day Dining Pass if you plan to eat more than 2 meals at the park. A typical adult meal at Busch Gardens can cost between $10 and $20. Many guests will eat only a single meal and perhaps enjoy a snack or 2 while they’re at the park for a day. But if you’re planning to eat more than 2 meals at Busch Gardens on a single day, then you’ll probably save more money buying an All-Day Dining Pass. With an All-Day Dining Pass, you get all the food and drink you want at certain restaurants in the park for one price. #9 – Find Busch Gardens discount tickets to save money. You don’t always have to pay full admission price to enjoy a day at Busch Gardens Tampa! Waves of Honor free military admission tickets — Are you or an immediate family member an active-duty military member? If so, that individual and up to 3 direct dependents can get free 1-day admission to Busch Gardens 1 time each year. EZ-Pay tickets — Busch Gardens EZ-Pay passes allow you to defer the full cost of an annual pass into monthly payment installments. Not only does this option help lessen your out-of-pocket admission expenses on your initial visit to Busch Gardens using the EZ-Pay pass, but you’ll also qualify for annual passholder benefits. AAA discounts — The American Automobile Association (AAA) offers a variety of specials that will help you save money on admission to Busch Gardens. CityPASS — Want to visit Busch Gardens and other select attractions in Tampa? CityPASS may be the best option for you. CityPASS provides savings of up to 50% off regular admission prices when you buy a bundle of 1-day admission tickets for a certain group of attractions. Online specials — If you subscribe to Busch Gardens email notifications or check out the park’s website, you’re sure to eventually receive an offer that can help you save money on admission prices. Local coupons — Check the local newspaper, fast food restaurants, grocery stores, and other sources for Busch Gardens discount tickets. Radio station giveaways and raffles are other great ways to score free tickets to Busch Gardens Tampa. Busch Gardens opened in 1959 as a visitor center for the Anheuser-Busch brewery that opened on-site that year. By the end of the 1970s, the African-themed park had become an internationally known destination for roller coaster fans, animal lovers, and fun seekers. 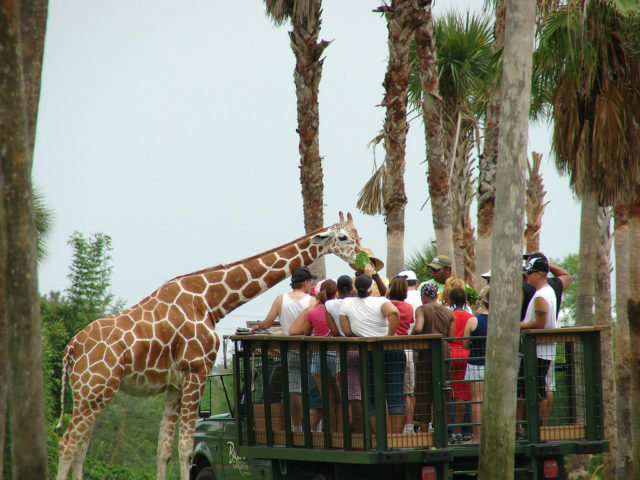 The tourist attraction is one of the top theme parks in Florida, and it’s usually at the top of must-see lists among those who visit the region.